A very quick and simple fish supper, adapted from this recipe. Set the grill to its highest setting. Put the salmon fillets flesh-side up and evenly spaced in a shallow flameproof dish. Finely grate the zest of the lime into a bowl, then squeeze in the juice and stir in the honey, mustard and a good sprinkling of salt. Pour the mixture over the salmon and grill, without turning, for 5-6 minutes until it’s golden on top and cooked through (check the centre with a fork). Meanwhile, tip the beans into a saucepan and add garlic and plenty of salt and pepper. Turn the heat on to moderate and coarsely mash everything together – a wooden spoon or a masher will do the job – until hot and bubbling. This only takes a few minutes as the beans are already cooked. Tip in the rocket and stir into the mash until it’s hot and just wilted. 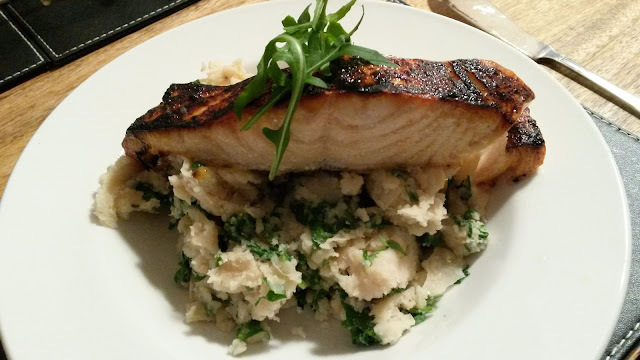 Serve the salmon on the mash, drizzled with the cooking juices. * Honey (1 level tsp) is 1 syn, so half a syn per portion. Always double-check the syn values I give as these can change from time to time. 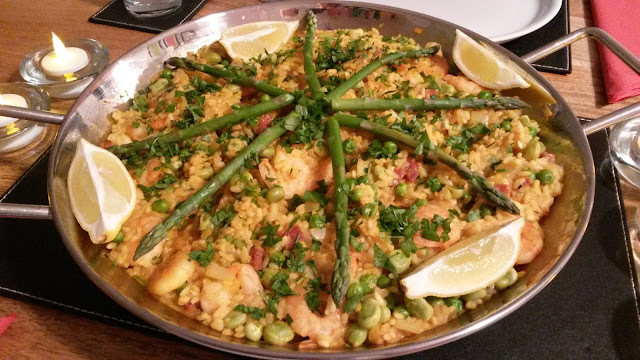 It's ironic in the extreme that I spend 16 years living in Spain and one of my favourite paella recipes comes from Slimming World, but here it is, as seen in the July 2015 magazine. We did make some minor changes. Add the prawns, broad beans, beans and peas to the dish and cook for another 10 minutes, or until the prawns are cooked. Add the lemon juice and season. Serve garnished with the asparagus, parsley and lemon zest with lemon wedges on the side. * This quantity of chorizo will work out to just less than 1.5 syns per portion. Always double-check the syn values I give, however, as these do change from time to tim. Place a large, non-stick frying pan over a medium heat. Add the onion and garlic and stir-fry for 1-2 minutes. Add the cayenne pepper or paprika, cinnamon, cumin and beef mince and stir fry for 5-6 minutes. Add the tomatoes and peppers and bring to the boil. Season well, cover tightly and cook over a low heat for 20-25 minutes. Add the beans, stir to mix well and return to the heat for another 10 minutes. Meanwhile cook the rice according to the packet instructions, drain and keep warm. Remove the chilli from the heat and serve in warmed bowls with the rice. Garnish with the coriander, if using, and serve with chunky salad or salsa. Remove the chilli from the heat and serve in warmed bowls with the rice. Garnish with the coriander, if using, and serve with the chunky salad. After the authors of the PACE trial brushed off his statement that conflicts of interest were not reported to the trial participants, he did some research. Predictably, he found that not only were three of the four principal researchers hired as consultants for insurance companies, but that decisions made by those companies had direct bearing on PACE findings and on recommendations made by PACE authors. Keep your eyes on the oxygen molecule. Your body thrives on it. It’s at the heart of your aerobic energy production system. When it’s working correctly you’re filled with clean, abundant energy. When its not you’re in trouble. You have a clean and efficient energy producing system and a ‘dirty and inefficient energy producing system. Guess which one is broken in ME/CFS? Multiple systems explode into action in order to get that oxygen to your muscles when you exercise. You breath more deeply and your heart pumps harder and faster to transport it just as quickly as it can to your cells. That heart/lung/muscle connection is the oxygen highway. You have a second (mostly backup) energy production system but it’s a dirty, inefficient and even painful system to use. Called anaerobic glycolysis it mostly kicks in only after your aerobic (oxygen-using) energy production system has pooped out. If you exercise long and hard enough (or if you have ME/CFS – not very long and not very hard) the pain and fatigue you experience when you switch to anaerobic system is unmistakeable. At that point things get complicated quickly. With anaerobic glycolysis comes lactic acid, and with lactic acid comes lactate, and with lactate comes CO2, and with CO2 comes a big problem. CO2 displaces oxygen – the life blood of our system – so it’s got to be removed fast, and so into the blood and out the lungs it goes. As the CO2 levels in your blood rise your breathing rate speeds up automatically just to get it out of your system. Most of us, are very familiar, with the feeling of being off balance. Simply standing up can sometimes, be a challenge. walking up or down steps, have strange sensations in our head. etc. to help, when it hits. This is thought to be due to Fibro and/or ME/CFS causing our equilibrium to me off. Each of us have experienced overdoing and then trying to recover. As well as getting overly stressed and trying to recover . A recovery period may also take place, from being exposed to a chemical, an odor, too much heat or cold. Of course, we all know that it takes us much longer to recover from a cold, flu, sinus infection, UTI, etc. Having a procedure such as a colonoscopy, dental work, any type of surgery, or getting an injury, leaves us with a lengthy recovery time. This recipe was from the Slimming World's Food Glorious Food cookbook. We've made a couple of small adjustments, as usual, but they certainly didn't detract from the flavour. The (syn-free) stuffing balls are made from Linda McCartney Vegetarian Red Onion & Rosemary Sausages. Preheat your oven to 180°C/Fan 160°C/Gas 4. Tuck the lemon and rosemary inside the chicken and place it in a roasting tin, season well. Roast for 1 hour 30 minutes, spooning over the juices from time to time, or until the chicken is cooked and the juices run clear when the thickest part of the leg is pierced with a metal skewer. Remove the chicken from the oven, cover with foil and leave to rest in a warm place for 10-15 minutes. Meanwhile, make the gravy. Put the stock in a pan and bring to the boil. Add the stockpot and simmer for 3-4 minutes or until slightly reduced. Remove the chicken skin, drain off all of the fat and carve the meat. 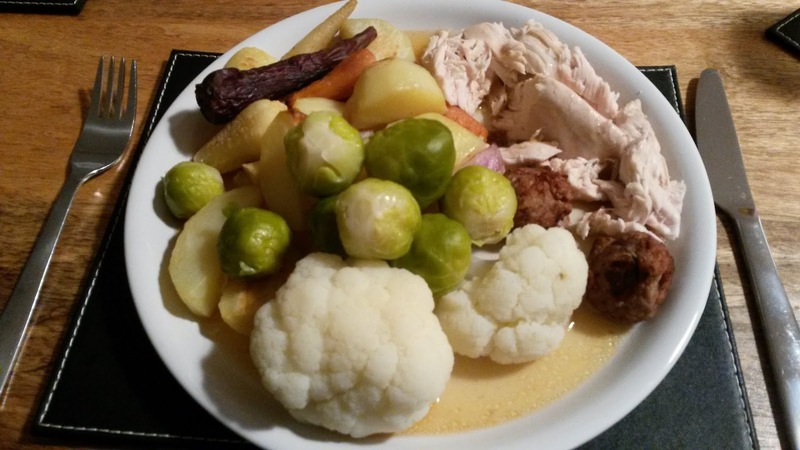 Garnish with the extra rosemary sprigs and serve with the gravy, roast potatoes and your favourite vegetables. Based on this recipe, just omitting a couple of synful ingredients, this dish turned out to be an unbelievably pleasant surprise. It uses ingredients that are probably cheaper than chips, yet was a surprisingly sophisticated and very tasty fish supper. As you can see, we served this with roasted red and yellow vine tomatoes and spinach, rocket and watercress salad. Cook the potatoes in boiling salted water until tender, about 15-20 mins. Meanwhile, coarsely mash the sardines in a bowl (there’s no need to remove the calcium-rich bones as they are soft enough to eat). Mix in 3 tbsp chopped parsley and half the lemon zest and juice. Meanwhile, mix the yogurt with the remaining parsley, lemon zest and juice and some seasoning. Drain the potatoes, then mash until smooth. Gently mix into the sardine mixture and season. 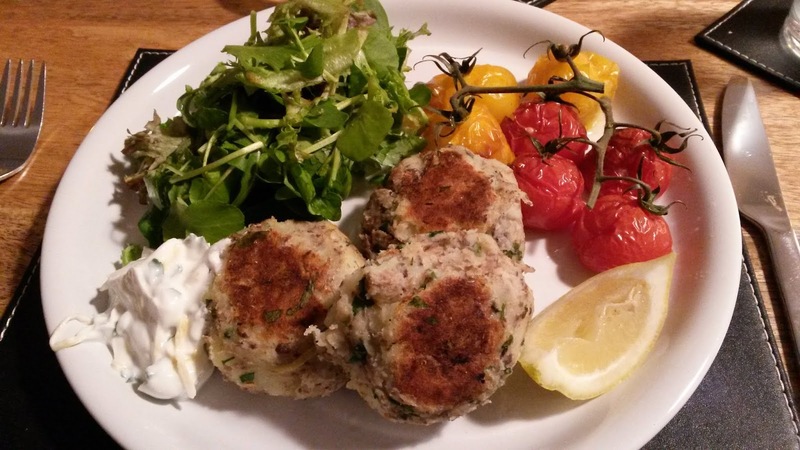 Shape into 8 fat fish cakes. Heat a non-stick frying pan and fry half the fish cakes for 3-4 mins on each side until golden and crisp. Keep warm; repeat with remaining fish cakes. 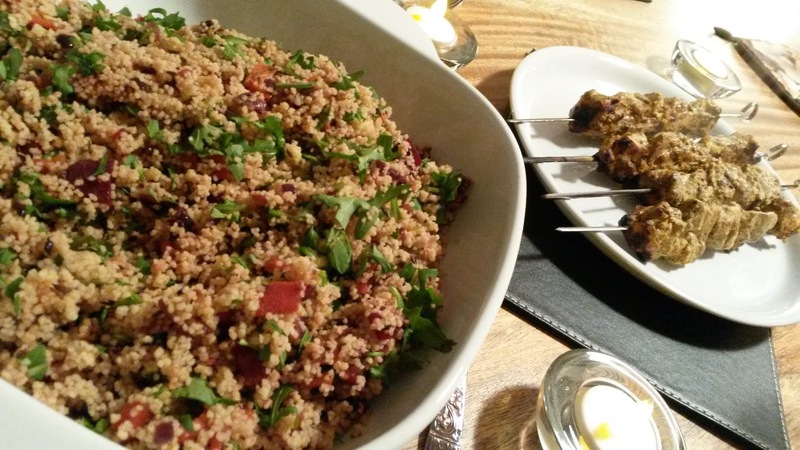 Serve with the lemony dip, salad and lemon wedges. From the SLIMMING WORLD'S FAKEAWAYS cookbook. It made a perfectly good - not to mention cheap - mid-week vegetarian meal. It would be even better as a side dish with a curry. Place a large non-stick saucepan over a medium heat. Fry the onions for 5 minutes or until softened then add the ginger, garlic, cumin seeds and most of the chillies and stir-fry for a further 1-2 minutes, stirring frequently. Add all the remaining ingredients to the saucepan along with 550ml of boiling water and cook for 15-20 minutes. Remove from the heat and leave to stand, still covered, for another 15-20 minutes. Garnish with the remaining sliced chillies and serve hot with a side dish of fat free natural yogurt sprinkled with paprika or chilli powder. Cook your spaghetti in a large pan of salted boiling water according to the packet instructions. Meanwhile, heat a large frying pan and toss in the garlic and chilli. As the garlic begins to colour, add the prawns and sauté them for a minute. Add the tomato purée and simmer for a couple of minutes. When the pasta is ready, drain it in a colander, reserving a little of the cooking water. Toss the spaghetti with the sauce, squeeze in the lemon juice, add half the chopped rocket, adding a little of the reserved cooking water if you want to loosen the sauce a bit, and correct the seasoning. Divide between 4 plates and sprinkle with the grated lemon zest and the rest of the rocket leaves. 590 Deaths Linked To ESA Plus Will Online PIP Claim Form Be Compulsory? In this edition, newly published research into ESA claimant suicides and the discovery of another coroner’s ‘prevention of future death report’ offer final proof that the DWP does not care whether its policies are killing many hundreds of claimants. It only cares that it can still get away with denying it. We also have news of the testing of a cost-cutting, online PIP claim form and details of our updated guide to successfully challenging PIP medical reports. Just yesterday, respected academics from Oxford and Liverpool universities published an article in an international, peer-reviewed scientific journal. Their research shows that the reassessment of incapacity benefit claimants for ESA is linked to an additional 590 suicides in England. It is also implicated in an additional 279,000 people developing mental health conditions and 725,000 more antidepressant prescriptions being issued. The relationship between the use of the work capability assessment (WCA) and the rise in deaths was clear and the researchers were at pains to rule out other causes. Any responsible body, even if they were doubtful of the findings, would have responded with concern and given an undertaking to look closely into the matter. The DWP, however, instantly dismissed the research out-of-hand. They know that they are the only people who could provide the data to prove beyond any possible doubt that the WCA is a killer. And they are never going to do that. Instead, just as the tobacco companies argued for so many years that no causal link between smoking and cancer had been proved, the DWP argue that suicide is complex and you can’t definitively prove that the WCA causes any deaths. And so the entirely avoidable deaths will continue. And there’s more proof of the DWP’s callous disregard for claimants’ lives. Once again, it is campaigning journalist John Pring who has brought it to light. In 2010, a coroner sent a ‘prevention of future deaths’ letter to the DWP in relation to a claimant with a mental health condition who had committed suicide after scoring zero points at his WCA. The claimant, Stephen Carre, had a community psychiatric nurse and a psychiatrist but they were never contacted by the DWP. On receiving such a letter from the coroner, the law requires the recipient to respond within 56 days saying what they are going to do to prevent future deaths. It now seems that the DWP simply wrote acknowledging receipt of the letter and then did absolutely nothing more, in flagrant breach of the la50 ways to challenge a PIP medical report coverw. Not only that, they also withheld the fact of the coroner’s letter from Professor Harrington, the independent reviewer of the WCA. If the matter had been brought to his attention, it might have prevented the DWP from pushing ahead with the mass reassessment of all incapacity benefit claimants using the WCA. And almost 600 people might not have taken their own lives. 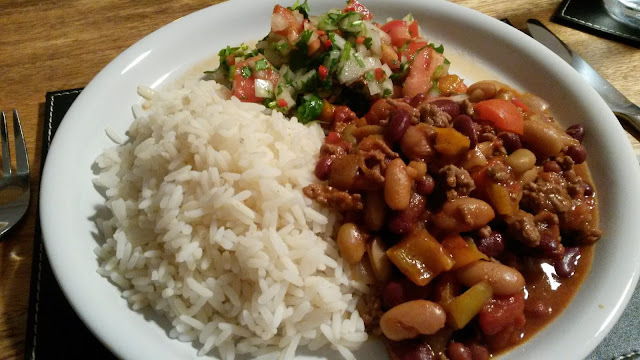 Being pretty familiar with Spanish food from living in Spain for 16 years, I can tell you that this recipe, from the Slimming World Mediteranean Magic cookbook, bears not much more than a passing resemblance to the traditional Asturian stew made with chorizo and morcilla sausages, fatty pork and fabada beans. To turn that from a very fatty dish into one that's free was bound to need some very noticable adjustments; To still end up with a really tasty dish that's also simple to put together says much about the skill of the Slimming World chefs. 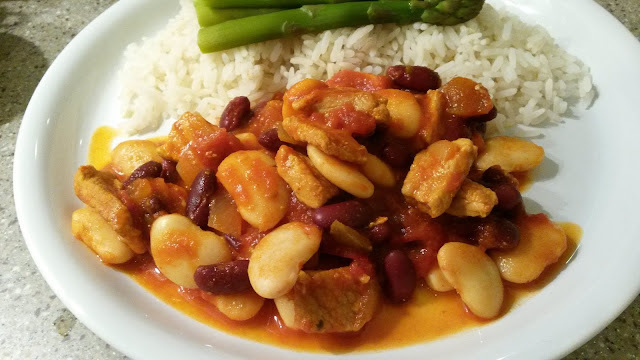 It's a superb version of Pork and beans, whatever you call it. Oh, and it still does its job like any other pork and beans dish! Place a large non-stick pan over a medium heat. Add the pork and fry for 4-5 minutes so that it's nicely browned, but not cooked through, then transfer to a plate and reserve. Add the onion and chilli to the same pan and fry for 2-3 minutes or until softened. Add the paprika, saffron, garlic, stock, tomatoes and beans, then return the cooked pork to the pan and stir well. Bring the mixture to a gentle simmer over a low heat, cover with a lid and cook for 45 minutes or until the sauce is thickened. Add a few tablespoons of water now and again if the sauce is looking dry. Ladle the stew into warmed shallow bowls, sprinkle over the parsley and season with salt and freshly ground black pepper. This is fantastic served hot with rice and salad. Onward Through the Fog: Why Was the FINE Study Disappeared? "David Tuller has posted another wonderful article in his series on the PACE trial. In this article he asks the important question, Whatever happened to the FINE study? The FINE study was published shortly before the PACE trial. (You can read the FINE study here.) It used similar treatment strategies as well as a similar timeline as PACE, but unlike the PACE trial the authors concluded at the end of 70-week study that patients had not significantly benefited from "pragmatic care" (supportive listening, and gradually increasing activity). Tuller's question is perfectly valid. Why does everyone cite the PACE trial, with its dubious claims of "recovery," while ignoring the FINE trial, which made no claims that patients had gotten better, let alone recovered?" "You’ve probably read aboutfibromyalgia symptoms such as pain, fatigue and fibro fog, but the list of possible symptoms is far-reaching and body-wide. Those tiny lists don’t even begin to describe our experience! I put together this “monster list” of 60+ symptoms to let you know that you’re not alone!" "The Mighty teamed up with the National Fibromyalgia Association and asked their community what they wish others understood about the disease. Here’s what they had to say:"
"A tiny proportion of disabled people with the neurological condition ME are receiving the social care they could be entitled to, according to a “shocking” new report from a charity. Action for ME surveyed 850 people with ME* (myalgic encephalomyelitis), and found 97 per cent of them could be entitled to state-funded care and support, but only six per cent had been given a care package by their local authority, while only 16 per cent had been given an assessment of their needs. The report, Close to Collapse, will form the basis for a formal inquiry led by the charity and supported by the all party parliamentary group on ME, which will examine the challenges faced by people with ME and chronic fatigue syndrome in accessing support. The report also found failings in provision of advocacy support for people with ME, with nearly four in five of those who responded to the survey not having access to an advocate. Action for ME is now seeking funding to establish a national advocacy service." 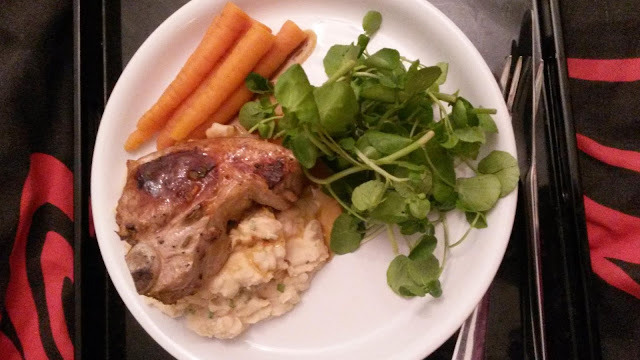 From the old Slimming World Extra Easy cookbook, this recipe is another of those dishes that you think you know well, then you're pleasantly surprised as it's much better than you remembered and were expecting. Place a large, non-stick frying pan over a medium heat. Add the onion and red chilli and fry for 2-3 minutes. Add the cinnamon and minced beef and fry for 3-4 minutes. Add the tomatoes, concentrated stock and chopped basil and bring to the boil. Season well, cover tightly and cook over a low heat for 20-25 minutes. While the sauce is cooking, cook the pasta according to the packet instructions. Drain and return to the saucepan. Pour over the meat sauce. Toss to mix well, garnish with chopped basil. My own view is that capability for work shouldn’t be assessed by asking whether you can look after your pet, or watch daytime TV, as currently happens in the WCA. It should be based on things like how many hours a week you could work, to what extent your capacity for work fluctuates and whether these variations can be predicted or controlled or not. What matters is not whether you can walk 40 metres or 60 metres as much as whether the effort of a simple commute into work leaves you next to useless once you get there. "After a battery of diagnostic tests for viruses and bacteria, [Montoya] continued Cavanagh Kramer on one of the antivirals she'd been prescribed, but made a few important changes: He added anti-inflammatory and immune-modulating drugs, as well as an antibiotic for the bacteria he found in her blood. ... Historically, many doctors considered CFS a psychosomatic disorder that required psychological—not medical—intervention. But recent research by Montoya and others has compelled the medical community to take the condition much more seriously. ... Montoya and his colleagues, however, were able to pinpoint immune abnormalities in the blood of CFS patients who had recently become ill, suggesting possible biomarkers for the disease. ... A picture of patients with highly inflamed bodies emerged before our eyes and validated what they've been telling us for decades." Such a simple dish, but with a surprisingly rich flavour. This appears on the page for October of Slimming World's 2016 calendar (free with the last magazine), but I must urge you not to wait until then to try it. We made some minor changes, as usual. Oh and just as you should with wine, choose a cider you'd be happy to drink as it will make a huge difference to the quality of the end result. Preheat the oven to 160C/Fan 140C/Gas 3. Place a large ovenproof caserole on a medium-high heat and lightly brown the pork for about 3-4 minutes. Remove the pork from the pan and reserve. Turn the heat down to medium, add the onion and cook gently for 10 minues, or until softened, adding a splash of water if they stick. Add the carrots and cook for a further minute. Stir in the cider and stock, season, add back the pork, add the cabbage and thyme. Arrange the potato slices on top so they overlap. Cover and bake near the to of the oven for 1 hour. Remove the lid and cook, uncovered, for 30-45 minutes, until the potatoes are golden. 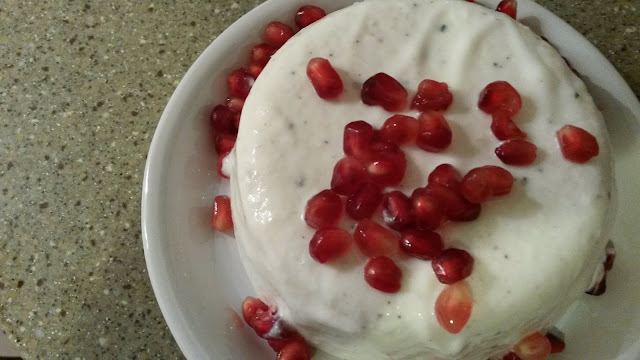 Listed merely as Cardamom Panna Cottas in the Slimming World Christmas book, the Cardamon and Vanilla Panna Cottas recipe online is essentially exactly the same and makes for a very elegant desert. Whisk the quark. Add the cardamom seeds, sweetener, vanilla extract and yogurt, and continue to whisk until the mixture is smooth. Place 2 tbsp of hot water in a small heatproof bowl and sprinkle with the gelatine/agar agar. Stand the bowl in a saucepan of simmering water and stir until the gelatine/agar agar has dissolved. Cool, and then whisk into the yogurt mixture. Beat the egg whites until softly peaked and gently fold through the yogurt mixture. Spoon into four individual moulds. Chill into the fridge for 3-4 hours, or overnight, until set. Dip the moulds in hot water for a few seconds and tip out onto serving plates. Sprinkle with the pomegranate seeds and serve immediately. Based on this recipe from BBC GoodFood, we omitted some of the more synful ingredients to make this dish more slimming. Preheat the oven to fan 170C/ conventional 190C/ gas 5. Rub the haddock fillets with the spice blend and set aside. Put the couscous into a large heatproof bowl. Pour over 500ml/18fl oz of boiling water and leave to soak for 5 minutes. Meanwhile, in a frying pan, cook the onion gently for 5 minutes, until it’s soft and golden. Fluff up the couscous with a fork, then add the onion, orange zest and juice, and half the parsley. Stir together thoroughly and season with black pepper. Tip into a roasting tray and level the surface. 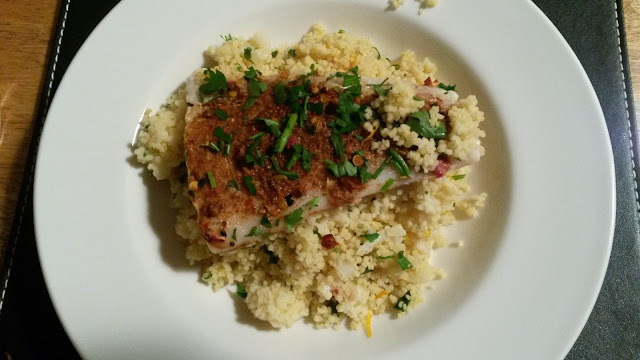 Arrange the fish fillets on top of the couscous. Cover loosely with a large piece of foil. Bake for 15-20 minutes, by which time the fish should be cooked – it depends on the thickness of the fillets. To check, the flesh should look opaque and flake easily when prodded with a fork. Serve at once, sprinkled with the remaining parsley. Slimming World members: As a guide, the juice of one orange is currently 1 syn, so this would work out at a negligible .25 of a syn per portion. If you have syns to spare, why not add back a few sultanas? Always double-check the syn values I give, because these can change from time to time. 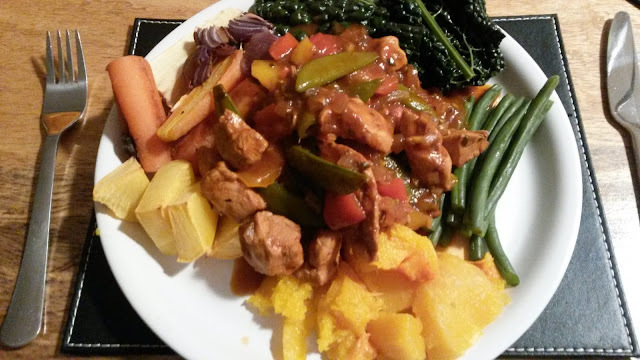 "Slimming World's Diet Cola chicken is simply delicious, made with tender pieces of chicken and served with plenty of fresh vegetables for lighter option. 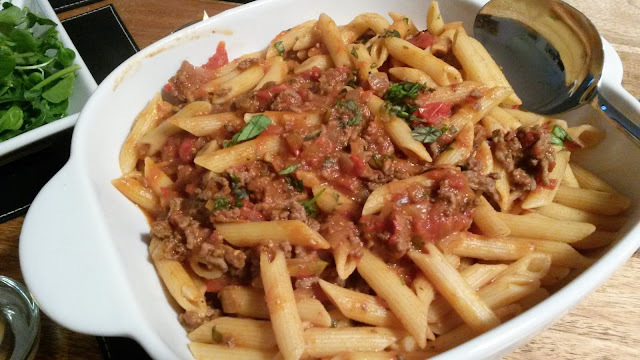 This mouth-watering meal is ready in under an hour and serves 4 people. The Diet Cola adds a sweet flavour and sticky texture along with the soy sauce, Worcestershire sauce and passata. If you’ve never tasted this quirky classic loved by Slimming World members, you’re in for a treat. Once you’ve tried it, you’ll be hooked!" Stir-fry the chicken, peppers and onion over a high heat for 4-5 minutes, or until lightly browned. Add the diet cola, stock, passata, tomato purée, garlic, Worcestershire sauce, soy sauce and dried mixed herbs and stir well. Bring to the boil, cover, reduce the heat to medium-low and simmer for 12-15 minutes. Add the sugar snap peas, stir and increase the heat to medium-high. Cook for another 10-15 minutes, or until the chicken is cooked through and the veg is tender. This recipe appears in the "old" Slimming World Extra Easy cookbook. It also appears online on the USA Slimming World site. It is really, really worth seeking out the very best fillet steak you can find at a butcher or farm shop, rather than the supermarket for this. 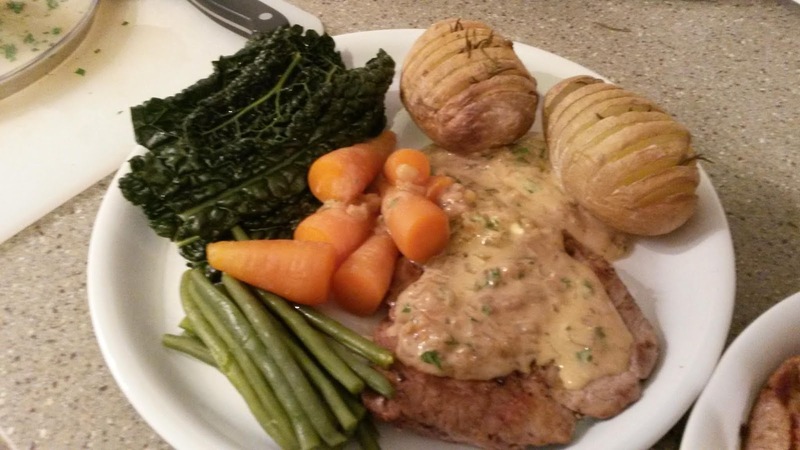 We left out the only synful ingredient - the wholegrain mustard - and added a few vegetables. Preheat the oven 200°C/Fan 180°C/Gas 6. Cut thin slices into each potato at regular intervals, making sure not to cut right through. Place the potatoes on a baking tray. Put the rosemary sprigs into some of the slices. Sprinkle with salt and cook in the oven for 10 minutes. Remove from the oven, turn the potatoes and cook for an additional 30–40 minutes or until cooked through. Set aside and keep warm. Meanwhile make the sauce. Place the shallots, mustard powder and stock into a small pan, whisk to mix well and bring to a boil. Reduce the heat, add the mushrooms and simmer for 8–10 minutes. Remove from the heat and stir in the yogurt and chopped parsley. Season with salt and pepper to taste and keep warm. Season the steaks with the crushed peppercorns and some salt. Place a pan over a high heat. Cook the steaks for 5–6 minutes on each side, or until cooked to your liking. Divide the potatoes and steaks among four plates, drizzle the sauce over the steaks and serve with the wilted spinach. A high WHR suggests excess fat around the waist, as muscle mass is unlikely to lead to greater waist circumference. Although this study does not explore why WHR may be linked to chances of dying earlier, other studies have shown that carrying excess fat around your waist may be more harmful than carrying it in other areas, such as your legs and hips. Fat around the waist has been linked to inflammation, increased risk of diabetes, and having raised cholesterol. This review looked at 15 weight loss studies and three studies measuring weight maintenance where some form of a green tea preparation was given to one group and results compared to a group receiving a control. Neither group knew whether they were receiving the green tea preparation or the control. A total of 1945 participants completed the studies, ranging in length from 12 to 13 weeks. In summary, the loss in weight in adults who had taken a green tea preparation was statistically not significant, was very small and is not likely to be clinically important. This began life as Linsensuppe (German Lentil Soup With Frankfurter Slices), but to make it more slimming, we made a few adjustments and haven't put the frankfurters in during the cooking process, leaving them as an optional extra that you can add to each portion (in measured quantity), if desired. Rinse lentils thoroughly under cold running water (brown lentils don't need to be soaked before cooking). Gently fry the onion, leek, carrot, celery and bacon in a large pan for 5-10 minutes. Add the bay leaves, lentils and water to the pan and slowly bring to a boil. Skim the surface & simmer (half-covered) for 45-50 min or till the lentils are soft. Add parsley, season with salt and pepper to taste. Remove bay leaves and serve garnished with the extra parsley. Based on this recipe at BBC Good Food, those of you who know Slimming World will know that this dish qualifies for the Extra Easy SP plan. Put the butter beans, the garlic and 3 tbsp of water into a pan and heat through. Smash the beans with a potato masher until you have a rough mash, stir in the lemon juice and mint, season to taste and keep warm. Season each lamb steak with the black pepper and a sprinkling of salt. Heat a large frying pan until really hot. Add the lamb steaks and cook for 3 minutes on each side for pink meat or until cooked to your liking. Spoon the mash onto four warm serving plates and top each with a lamb steak. Quickly stir half a cup of water into the lamb pan, boil to make a sauce and spoon over the lamb. Add a handful of watercress to each plate and serve. [Researchers] found that eating vanilla yoghurts made people feel happy, and that yoghurts with lower fat content gave people a stronger positive emotional response. Their results also showed that even if people reported differences in liking them, yoghurts with different fruits did not show much difference in their emotional effect. This recipe appears in the Slimming World Food Glorious Food cookbook, but to be honest, it's so simple it hardly needs a recipe. Soak the gammon joint in cold water overnight (this helps reduce the saltiness). About 15 minutes before the gammon is done, put all the parsley sauce ingredients into a food processor and blend until smooth. Transfer to a small aucepan. Heat gently to warm the sauce, but be careful not to let it boil and split. Drain the gammon and discard the vegetables. 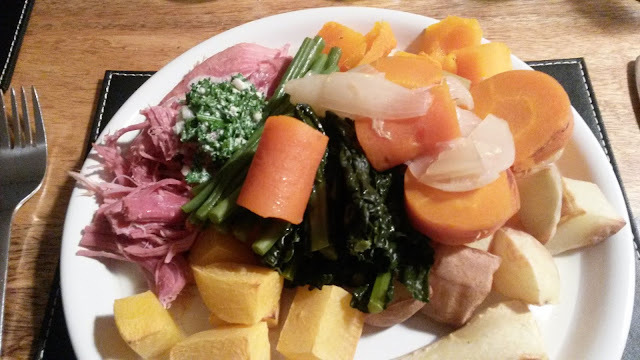 Slice the gammon and serve with the parsley sauce and your favourite potatoes and vegetables. From the Slimming World magazine in July 2015. Put all the sauce ingredients in a pan, bring to the boil, then reduce the heat to low and cook for 12-15 minutes. Keep warm. Meanwhile boil the potatoes for 15 minutes, or until tender. Drain and return to the pan with the stock. Mash until fairly smooth and season. Add the watercress and mix. Put the chicken between sheets of cling film and use a rolling pin to flatten slightly. Season well. Place a frying pan or griddle pan over a high heat and cook the chicken for 4-5 minutes on each side, or until cooked through. 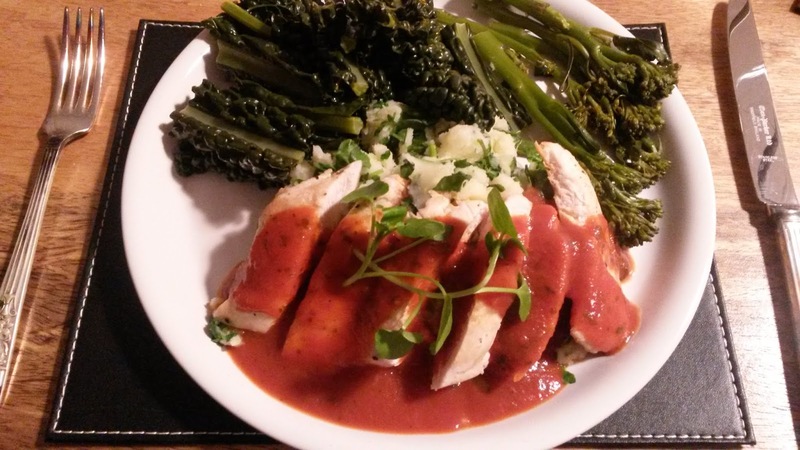 Divide the chicken and mash between 4 plates and top with the sauce. Garnish each with watercress sprigs and a lemon wedge. Serve with steamed green vegetables, such as beans and broccoli. 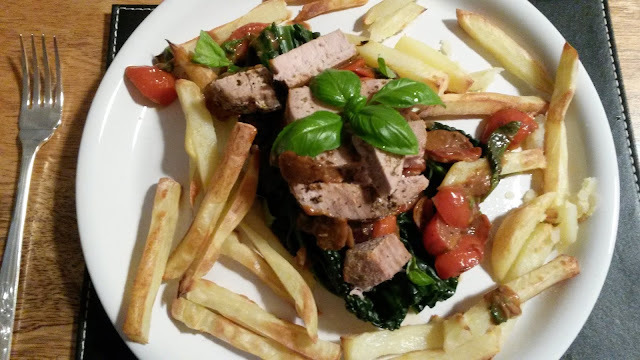 Based vaguely on a Jamie Oliver recipe, we've served this Italian-inspired tuna dish on a bed of cavolo nero (black kale) and surrounded by fat-free and syn-free chips. Peel and finely slice the garlic. Halve the tomatoes (cut any larger ones into quarters). Pick the basil leaves off the stalks and reserve the smaller sprigs for serving. Halve the lemon. Season the tuna with salt and pepper and sprinkle with oregano. Place a large frying pan over a high heat and cook the tuna for 1 minute on each side, then remove to a warm plate. Add the garlic and olives to the same pan and cook for 1 minute, then add the anchovies and tomatoes. Squeeze in the juice from one half of the lemon. Cook for 1 minute, stirring. Just before you take the pan off the heat, throw in most of the basil leaves. Squeeze in the juice from the remaining lemon half, toss everything together and season to taste. Divide the sauce between 2 plates. Slice the tuna steaks into 2cm strips and lay over the top. Dress with the reserved basil sprigs. * At time of writing 8 olives are 1.5 syns, so this is negligible .75 of a syn per portion. Always double-check the syn values I give as these can change from time to time. Using frozen vegetables, this makes a quick and simple mid-week meal. Place a large frying pan over med heat, add curry paste and chicken for 2-3 mins, add stock and coconut milk, bring to the boil, reduce heat and simmer for 10-12 mins until chicken is cooked. Add vegetables, bring back to a simmer and cook for 6-8 mins, remove from heat, stir in soy sauce and seasoning, put into 4 bowls, garnish with chilli and coriander. We served this on a bed of jasmine rice. Heat a large pan. Add the onions and fry for 5 mins until softened. Tip in the remaining vegetables and cook for another 5 mins, adding the chilli and cumin for final 2 mins. Add the lentils and stock to the pan. Bring to the boil, then lower heat and simmer for 25 mins until vegetables are tender and lentils are soft. Blitz until smooth and add a little extra water or stock, if necessary. Season, then reheat until piping hot.